Typo on my end. Fixed! When I try try pasting the Active and Cryo'ed columns, the columns I'd copied are no longer in the clipboard - that is, there seems to be nothing to paste. I have the two versions of the spreadsheet open in separate tabs in my browser - is there a different way I need to do this? It's probable that you have problem with browser. For me for example keyboard shortcuts do not work at all in my old Firefox, so I use Opera for GDocs. Try Edit - Copy and Edit - Paste. Hey @Leshy , would it be too difficult an ask to apply a similar "keep X crew" advanced setting to ACF and AUF recommendations as you have for 3-5* base/max crew or best crew? Hey @Baarogue. Not entirely sure what you mean; currently, the AUF and ACF requirements simply check for whether you have a crew that can complete the missions for each skill, and if you do, the requirement is fulfilled and is no longer a requirement for other crew. You would like the sheet to recommend more than one crew per AUF/ACF skill? No, that's not what I need. Right now it's marking every crew who meets weekend AUF/ACF requirements for keeping. I'd like it to be configurable to only recommend keeping the top X AUF/ACF for each skill. For instance, right now it has Kruge, Kang, Morn, Talos IV Spock, Hugh, Sniper Ezri, Lursa, Constable Odo, Tailor Garak, and Security Chief Tuvok all marked as "AUF SEC" in my "why should I keep?" column. For some of them, that's the only reason I "should" keep them. Obviously, I only need Odo, and/or Garak and was wondering if there were some way to remove the other entries aside from nuking the feature. Of course I know who I really want to keep for weekend crew, and the whole thing is nothing more than a distraction-level situation. I was just wondering if my only recourse was to mark "show adv. cadet" to No on the adv. settings page. Do you really have them all FFFE? Because if not it's problem with you marking them as FFFE. And if you have them all FFFE then honestly your situation is quite rare, early people neither have that many nor means to level them all, later they are worked one by one and go in crio to free space for 4*/5*. Earlier in the thread I described little trick to how put not-FFFE on the list for record keeping mostly without misleading scripts. About half of them are immortalized, yes. 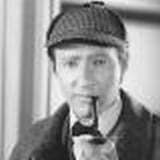 And I want the script to run on all the crew I own, immortal or not, optimally to show me which one or two I should keep or prioritize leveling for weekends so your trick isn't the way I want to go. Thanks anyway. I'm working around it for now by using the "best skill max" setting to see which of the auf/acf marked crew are also in that pool but it would be nice if it worked as Leshy described, and only marked the one best crew of each skill for the weekend. I'd like it to be configurable to only recommend keeping the top X AUF/ACF for each skill. I see what you mean now. Unfortunately that is not something to easily do, nor is it how I feel these missions should work. First of all, it does not seem useful for the sheet to recommend 'the best three' crew who can pass (for example) ACF ENG – you only need one crew who can do it, so the sheet should then only recommend the best one. However, determining 'the best' crew is not that easy: ranking crew by stats from high to low does not mean that the highest listed one is also the best crew for the AUF/ACF missions. Deanna Troi, for example, can pass AUF DIP, AUF MED, ACF DIP, and ACF MED on her own. Her DIP roll is 476 on average. Koloth can only pass AUF DIP, but does so with an average roll of 600. With such a ranking system in place, the sheet would end up recommending Koloth over Deanna Troi, and eventually with a large number of the highest-rolling crew, rather than a small complement of versatile crew. I would say that most people would prefer the latter. Taking this into account would get quite complicated quite quickly. If you have a bunch of active 3* crew who the sheet all says to keep around as they can do an ACF/AUF mission and you would like to downsize, I would suggest filtering the crew list by 3* and 'Active' status, and then just having a look yourself at what ACF/AUF missions appear multiple times. In combination with other requirements, you should be able to easily tell what crew you can get rid of. Yeah, that's what I've been doing. Thanks for looking into it! Quick update with the latest crew: 1.87 now in the OP! The base stats for Prisoner Michael Burnhum Security & Science need to be swapped. Hey Leshy. I've downloaded the file as an Excel doc and I'm getting an error message when I try to open it. At first the error message states 'Excel found unreadable content ......' and then asks me if I want to try and recover the contents. When I say yes it runs and I get this message ‘Excel completed file level validation and repair. Some parts of this workbook may have been repaired or discarded. Removed Records: Formula from /xl/worksheets/sheet3.xml part’. Hi Data, thanks for the suggestion but I still can't download it without errors. I even disabled by anti-virus protection to see if that was the problem. It may be that I am using Excel 2010. The sheet relies on several key functions that are available in Google Sheets, but not in Excel (mostly FILTER and QUERY). Exporting the sheet to an Excel file will likely not work for this reason. I downloaded and installed Opera for Windows, then again opened an old spreadsheet (v1.86) in one tab and the new spreadsheet in another tab (v1.87). I tried Edit - Copy and Edit - Paste as suggested, but I still have no Paste option, only Copy and Find and Replace. There must be something I'm missing; I wouldn't think it would be so difficult. I am copying exactly the same number of cells on both tabs, just the Active and Cryo columns for v1.86. 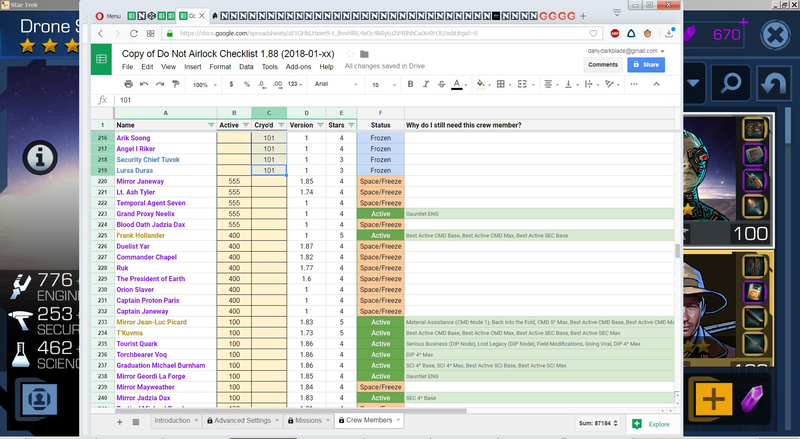 I made sure to make a copy of each spreadsheet to my Google Drive so I'd have write access. That would explain it. Thanks Leshy. 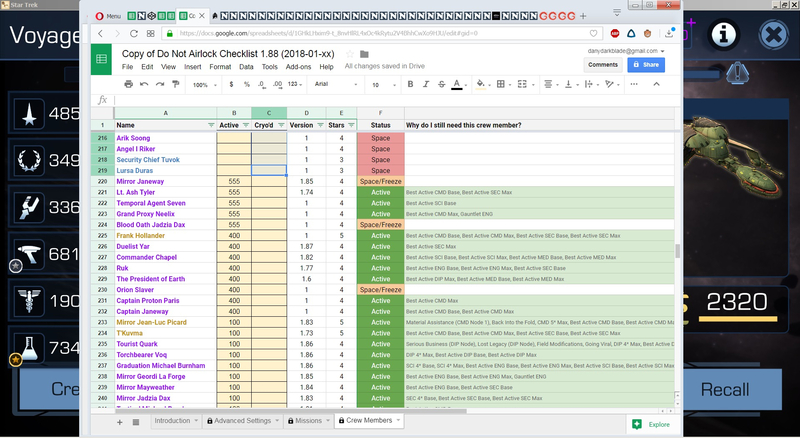 Maybe it's stupid question, but did you made your own copy of new spreadsheet? About "Adjust Number of Best Active Crew to keep for each Skill"... IMHO they should be separated. Currently for me ENG MAX take hotspot, despite the fact that I don't need that many of them despite not having that good ENG. I pushed number to 10 just to cover all base ENG that I need and Drone Seven still dropped out of the list despite being my best ENG 4*. Looking over the fact that Blood Oath Jadzia have "Best Active ENG Max" and Drone 7 does not (how 241+370 is better than 776+353 I do not comprehend) it should be in fact bug, which doesn't change fact that those two should be separate. After opening the spreadsheet I clicked on File - Move To, and moved a copy to my Google Drive. I then copied the copy in my Google Drive and renamed it to New Do Not Airlock v1.86. That is the one I'm trying to copy the columns from (New Do Not Airlock v.1.86). About "Adjust Number of Best Active Crew to keep for each Skill"... IMHO they should be separated. I assume you mean that you would like to be able to set a number per skill? It is something I will have to consider once the trait review is complete. Thanks, good spot. I had changed some columns around, and forgot to update the QUERY formula for those lists, which does not auto-update. That list now looks at the right column again. 1.88 in the OP, with the newest event crew in! I assume you mean that you would like to be able to set a number per skill? It does not work properly by the way. List shows only two characters with Best ENG for me now despite clearly specified 10 (and it doesn't show even them if I switch to 2) and, well, after deleting Freezer column it started working properly - it checks ALL crew now, not only active one - but shows it only for active. So, what is exactly point of "Best Active Crew" checking crew that is NOT active? Forgot to mention Mother Horta in the changelog. Thanks again for doing this. Super handy. Skill Voyage should be fairly similar to Skill Max. In addition, crew with a single high skill would be listed as good for Voyages, when you might be better off with crew with multiple almost-as-high skills. I'll have to look into this more later and see if there's a good way to implement it, and whether it does not slow down the sheet too much. Thanks, also very stealthily fixed! Well looks fine now. And I hope works fine. 1.89 now in the OP with the latest event crew in! Hey @Leshy, I dunno if they're going to change this in the future but apparently Prisoner Michael Burnham counts as (part) alien for the purposes of The United Federation. I'm actually considering replacing my Festive Jadzia with PMB on my weekly cadet lineup, but that will depend on if I'll need Jadzia's DIP for EAS or ACF.